Thanksgiving is all about friends, family, football — and, of course, food! 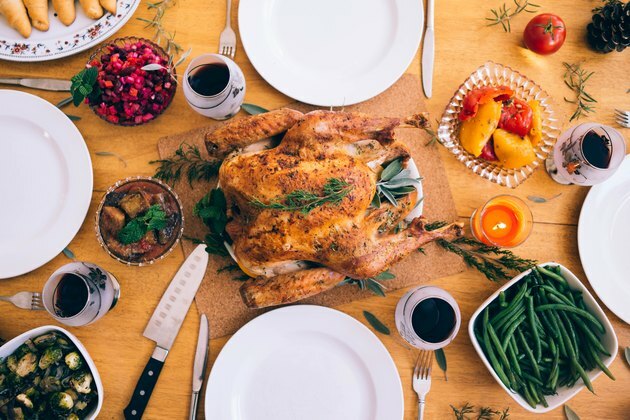 If you're a devotee of the popular high fat, low-carb keto diet but don't want to miss out on all your favorite holiday foods, here are some great suggestions for keto-friendly dishes and sides. Foods that would seem off-limits for the keto diet due to their high carb count (like pumpkin pie, or stuffing) can easily be made keto-friendly with a few simple tweaks. And the best part? These keto-swaps are absolutely delicious and in many cases, lower-calorie than the traditional carb-laden original recipes. Win win! Keep the charcuterie, but ditch the high-carb chip bowl for shrimp cocktail, crudites and deviled eggs to send your body into a metabolic state of ketosis, which promotes weight loss by depriving the body of carbs for energy and burning fat instead. 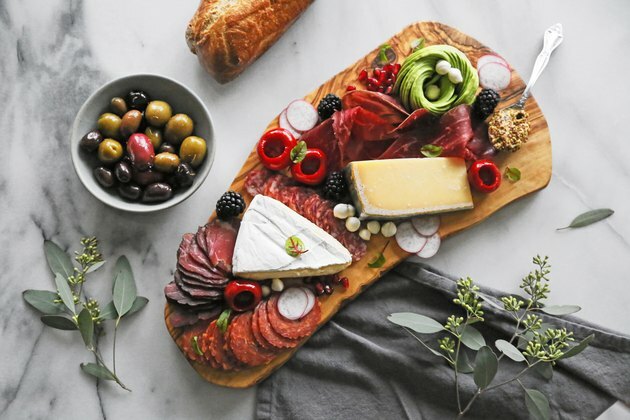 "Get creative with fatty, protein snacks," says Kelly Boyer, founder and CEO of Paleta, a healthy meal delivery service in Los Angeles. "Deviled eggs offer a great dose of protein. Shrimp cocktail is a classic that is high in both protein and fat and super easy since you can buy it already prepared. Serve with a side of homemade mayo with some horseradish for a little kick." Your classic Thanksgiving turkey is already very keto-friendly, and butter adds some much-needed fat to what can often be a very lean, dry bird. In terms of keto macros, you should be aiming for roughly 75 percent of your daily calories from quality fats, 20 percent from protein, and 5 percent from carbohydrates. 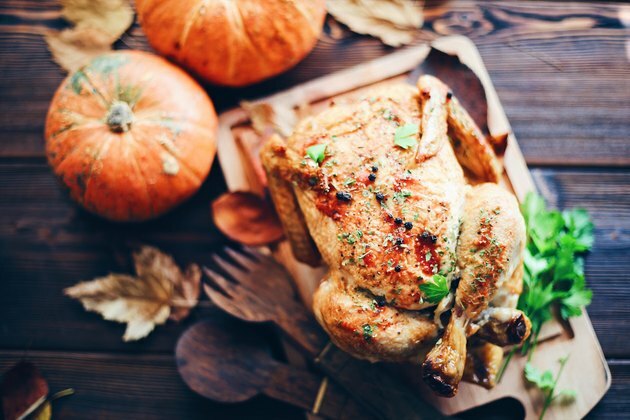 "Stick to your classic roast turkey, but give it a little more love this year," says Boyer. "Create a flavorful compound by adding herbs and lemon zest to your favorite brand of butter. Gently pull back the skin of your bird and generously apply this creamy mixture between the flesh and skin. Go extra heavy on the breast side, as it can dry out because of its lower fat content. "Another trick to keep your bird moist and flavorful is to roast your turkey with the breast side down. This way your drippings will roll into the breast instead of the legs and thighs, which are already fattier." "Grab your food processor or blender and toss in one cup of macadamia nuts and blend until smooth," she says. "Add five eggs one at a time and continue to blend. Add one cup of coconut butter and a teaspoon of salt and blend again. Add two tablespoons of lemon juice and a teaspoon-and-a-half of baking soda and blend to finish your mixture. Pour it into a greased loaf pan and bake in a preheated oven at 375 degrees for 35 minutes or until a knife comes out clean." This easy swap helps cut carbs, provides healthy fats and helps prevent you from feeling bloated after dinner. 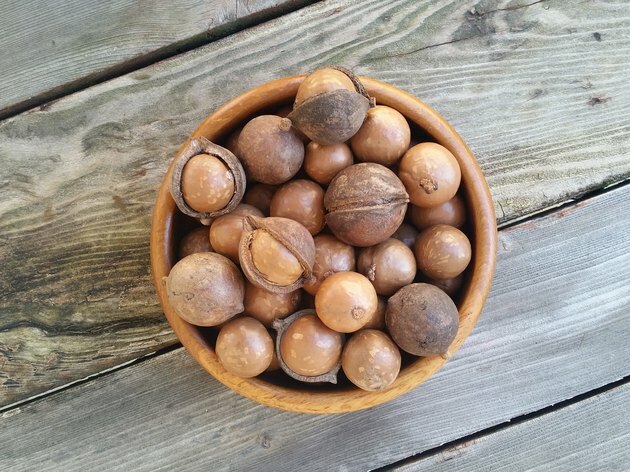 "Macadamia nuts are high in B vitamins and very high in fat, a goal for keto," says Amy Shapiro, a New York City dietician and founder of RealNutritionNYC. "Eggs provide texture and nutrients, and coconut butter provides medium-chain fatty acids we absorb quickly and use efficiently for energy." 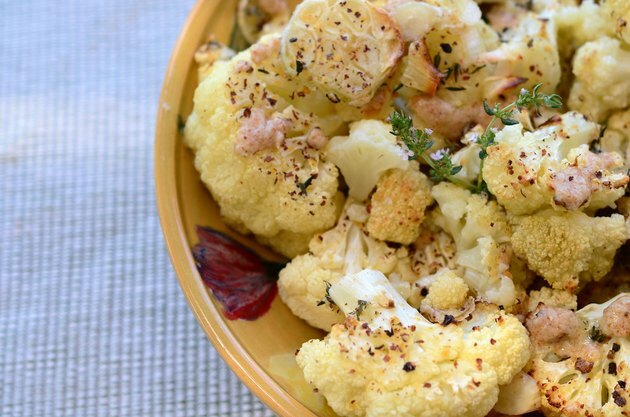 Cauliflower is the perfect swap for potatoes when it's pureed with herbs and spices. Unlike starchy spuds, this cruciferous vegetable is loaded with nutrients and vitamins, but extremely low in carbs and calories. "Simply simmer cauliflower florets in chicken broth for increased flavor and a protein boost until fork-tender," says Boyer. "Toss into your food processor, add butter or ghee, sour cream or cream cheese and lemon zest, then process until smooth. I like to garnish with a little chopped parsley." The best part? Your guests will barely even notice the difference, thanks to the robust, buttery flavor, but you'll cut tons of carbs and calories with this small substitution. "Cauliflower is high in vitamin C," says Shapiro. "It's also very low in calories, low in carbs and high in fiber." Yes, sweet potatoes are good for you, but they also contain a hefty dose of carbs. So why not try combining them with butternut squash instead? 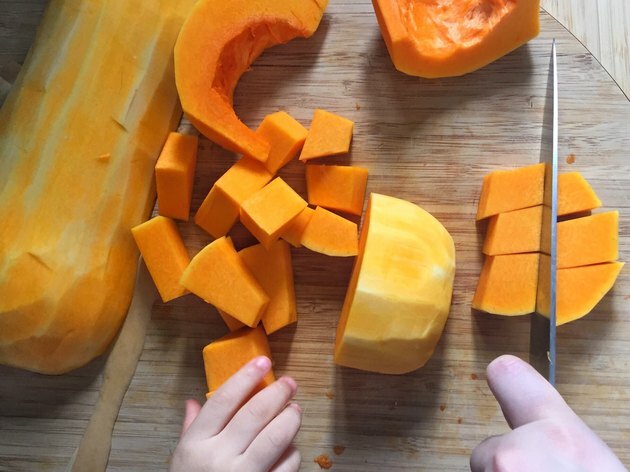 "Use a four-to-one ratio of butternut squash to sweet potato," says Boyer. "You'll benefit from increased calcium, magnesium, potassium and vitamins B-5 and E. Eliminate the marshmallow topping. Opt instead for chopped pecans, which become sweet during roasting. Add another kick by topping with crispy bacon or pancetta bits." Butternut squash gives you fewer carbs than sweet potatoes, but has a very similar flavor and texture, making it almost undetectable in your recipe. "Someone on keto could use this to fill their 10 to 15 percent carb requirement," says Shapiro. "It's also high in beta carotene and has powerful antioxidants that help improve eyesight." Classic green bean casserole is a staple at Thanksgiving dinner, but canned mushroom soup and fried onions both contain flour, which will up your daily carb intake. Luckily, a keto-friendly green bean casserole is not only doable, but very tasty. "I have never been a fan of condensed soup in this holiday casserole, so this recipe is a welcome replacement at my table," says Boyer. 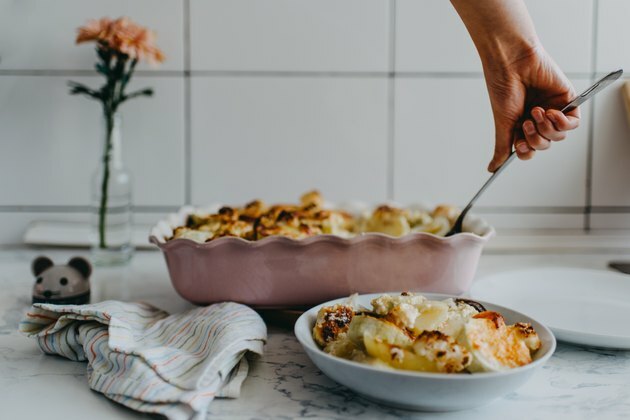 "Simply combine cream, butter, Dijon mustard, crushed garlic, grated Monterey jack or mozzarella cheese and a little chicken stock to create a keto-friendly green bean casserole base. Caramelized onions replace your french-fried onion topping. To make sure you don't miss the crunch of the carb-heavy canned onions, add chopped bacon or toasted nuts instead." These easy tweaks can help cut carbs without sacrificing flavor, so you'll still feel like you're indulging at dinnertime. "Caramelized onions provide a sweet flavor without sugar," says Shapiro. Repeat after us: Cranberry relish does not have to come in a can! 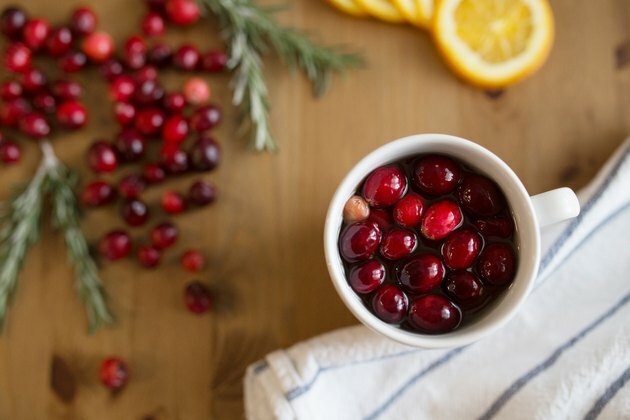 "Switch to a homemade,keto-friendly low-carb relish by simmering fresh cranberries with a sugar alternative like stevia or erythritol," says Boyer. "There is pectin in the cranberries, so they will thicken naturally. Add orange zest, a pinch of ground ginger and some almond extract for a more complex flavor profile." Aside from the carb question, this healthy cranberry reboot is a great way to get your daily dose of vitamins while decreasing your risk of inflammation. "Cranberries are nutrient-dense but very high in vitamin C," says Shapiro. "Ginger is also a powerful anti-inflammatory food." Cornstarch and flour are a great way to thicken gravy, but they're also extremely high in carbs. Instead, try adding xanthan gum to create a creamier gravy this year. "For me, pretty much everything on my holiday table is honestly used as a vehicle for the gravy," says Boyer. "My keto-friendly version eliminates flour or cornstarch by heating pan drippings, chicken stock and heavy cream in a saucepan until it reaches a low boil. Reduce heat and simmer uncovered for about an hour, then reduce by half. Blend with a hand-held immersion or countertop blender. Return the gravy to the saucepan and bring back to a simmer over medium heat. Add a dash of Worcestershire sauce, fresh thyme leaves and a pinch of xanthan gum. Whisk until desired consistency and serve!" Serve this keto-friendly gravy over mashed potatoes, turkey or stuffing for a satisfying side dish that is also low in calories. "Xanthan gum is lower in calories than corn starch," says Shapiro. "It's also void of carbohydrates, so it fits into this diet profile." 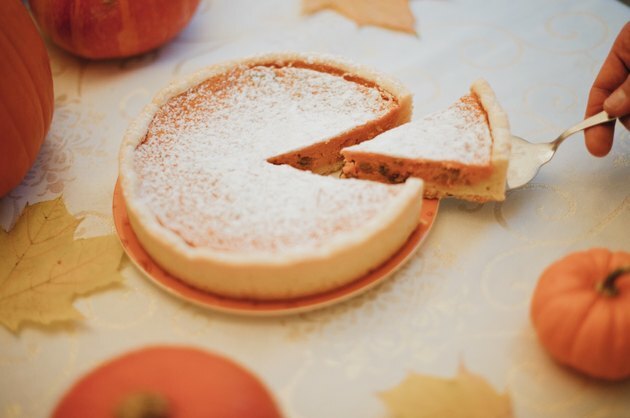 No traditional Thanksgiving dinner would be complete without a slice of pumpkin pie. Thankfully, pumpkin is chock-full of fiber, so there's no need to say "no thanks," as long as you make a few small tweaks. "Simply use a recipe combining unsweetened canned pumpkin, eggs and heavy cream or cream cheese," says Boyer. "Sweeten with honey and date paste and use a pie crust that is made with almond flour, chopped pecans and butter. Don't forget the whipped cream! Blend heavy whipped cream with vanilla and sweeten with a little stevia or honey after achieving the desired thickness." Although pumpkin is higher in carbs than other vegetables, Shapiro still gives this sweet treat her seal of approval. "When paired with all of these fats, it will balance out the carb load and insulin hit," she says. "It's also high in beta carotene and fiber."